6 Ways to Find Amazon Reviewers for Free! Customer reviews are highly important for Amazon sellers and positive reviews can greatly help to increase the conversion rate of a new listing by a few percentage points. For a new listing, just because you have an advertising budget it is no guarantee that you will receive positive reviews or an increase in sales. If an optimized listing has increased positive reviews then the rankings and sales will obviously improve. If the listing receives negative reviews, however, it will suffer a disastrous decline. It is clear that positive reviews are crucial to increasing listing rankings and product sales. It is one thing to know this, but another thing altogether to know how best to take advantage of it. Amazon sellers have been racking their brains trying to think of ways to find reviewers and more importantly, get more positive reviews from them. This article looks at 6 methods to obtain reviews and lays out the pros and cons for each. The aim is to help Amazon sellers to increase their listing rankings and product sales by increasing positive reviews. 100 Amazon reviewers email list GET IT FREE! If there are not enough sales on a listing, then there will not be any customer reviews. Sales must be made before there is any hope of getting some reviews. Finding buyers does not have to be difficult. 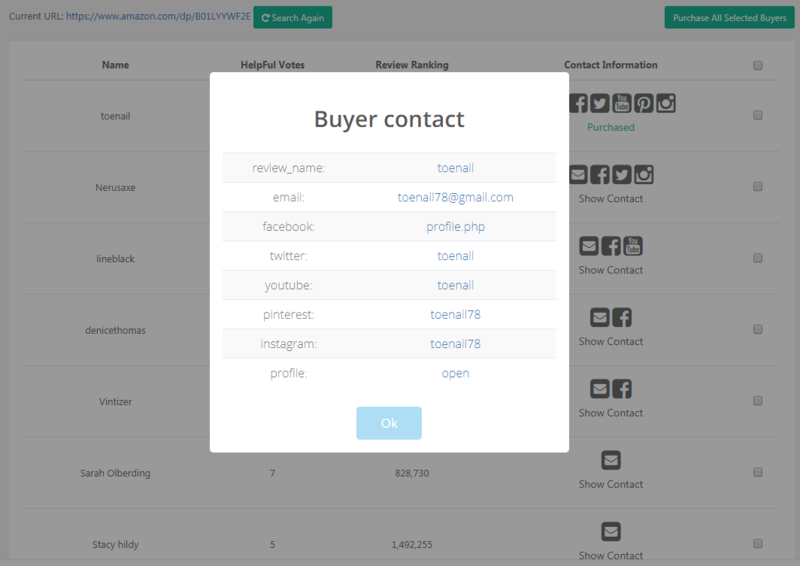 Many buyers add their contact information to their profiles on Amazon. 1.Go to the listing page and scroll down to the customer review section. Click the user name of the review. 2. Enter the profile of the user and click “Send an Email”. You will see the user’s email address. If you do not wish to contact this buyer yet, you can save the address to your email list. 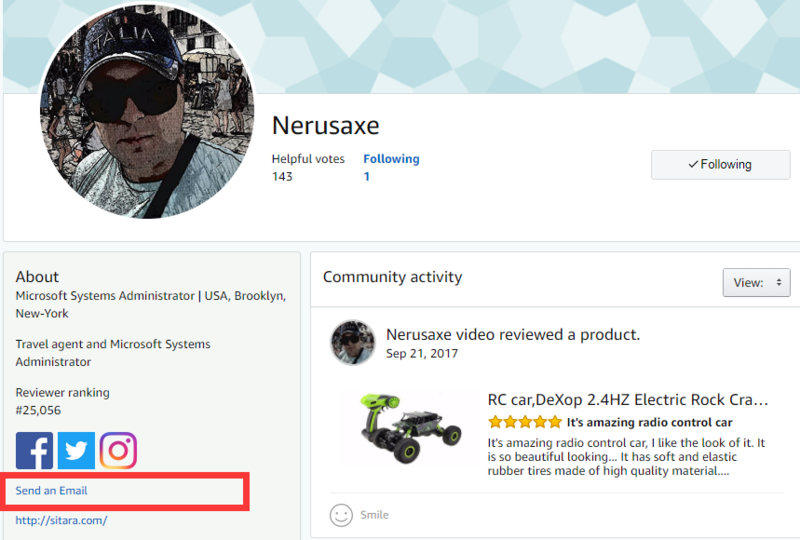 Pros: You can easily find the reviewer in your category without any cost. Cons: Not every reviewer is likely to share their contact details on Amazon. More often than not, you will not be able to find an email address for some listings. On top of that, it is also very time-consuming to check every email address one by one. You can check the top reviewers list on Amazon at https://www.amazon.com/review/top-reviewers. It gives you access to the contact information of some of the most qualified reviewers. Enter their profiles by clicking their user names and find their contact information. Pros: You can find excellent reviewers with good reputations. Cons: It can be very tedious as you have to click each user name manually. Also, many sellers will contact the top reviewers this way so your chances of getting a response are slim. Not only that, but Amazon has changed its rules for customer reviews for top reviewers. You can find out more information here at https://www.amazon.com/p/feature/abpto3jt7fhb5oc. Getting reviews from top reviewers is just not as effective as it was before. Some review trader sites can provide you with a review service. Simply register an account on one of these sites and launch the products. Reviewers will choose some products on the site they are interested in to leave reviews and get some discounts in return. This way, your products will have more chance to get exposure on the website. You can sell your products at discounted prices in return for sustainable orders that will help improve the rankings of your listings. Vipon is a discount website for Amazon products owned by AMZ Tracker. You must be a member of AMZ Tracker before you can get your products launched. Snagshout is free to register. It costs at least $5 to launch products and you can get discounts if they are launched in batches. Besides, there are some other platforms such as GiveawayService and iLoveToReview. If you are interested then you can give them a try. Cons: For some review sites like Vipon, you must use their additional services before you can get your product launched. Due to the nature of these websites, conflicts with Amazon are common. This is because the way they get reviews often violates Amazon rules and policies to some extent. This can also affect the sellers and they may be at risk for financial loss. Reviewers and sellers can be found in Facebook groups. You can post your products in these groups and if someone is interested then they will contact you. Pros: Reviewers usually keep a close eye in these groups for new postings so you can get a quick response. On top of this, postings in these groups are totally free. Cons: Many sellers lose contact with reviewers after they have sent out the product, so it can be hard to ensure they post a review. You need to be alert to frauds. Also, some reviewers will only select products that are of a particular interest to them. If your products are not attractive enough, it might not be a good use of your time to try using these Facebook groups. There are some freelancers who provide a product review service. For example, you can find freelancers on Fivrr to help you write reviews, with prices starting from $5. Pros: These freelancers are professional and they can provide valuable reviews. Cons: It’s not cheap. Beyond that, buying reviews is against Amazon rules and policies. If you go this route then your seller account will be at risk of being banned if Amazon is notified. AMZDiscover is an online Amazon seller tool. It helps sellers find excellent reviewers and potential customers in batches without any limit on the quantity. The information for reviewers includes their user name, reviewer rankings and helpful votes. It also includes their contact details such as their email, Facebook, Twitter and other social media accounts. On top of that, there is no need to download any apps. AMZDiscover is simple to get started. Just add an Amazon listing URL into the search box and click the search button. You will get a prompt that your listing is being searched. You are free to do something else while the reviewers are being collected from the listing. When it is finished you will be notified by email automatically. 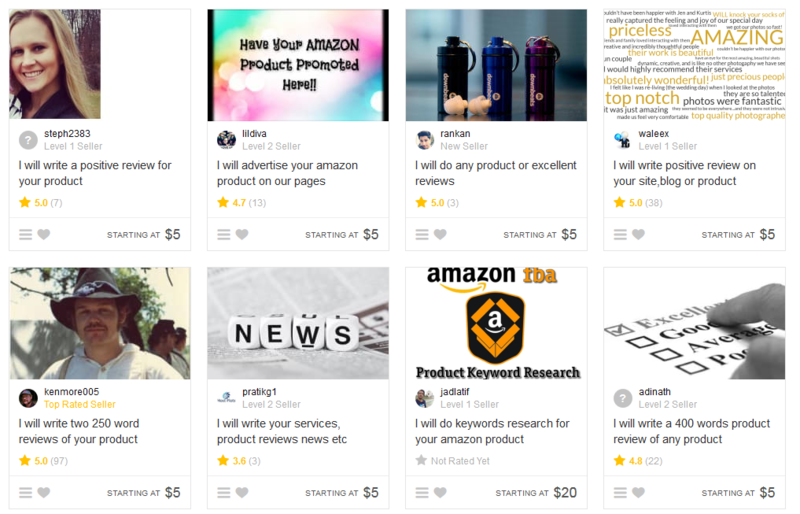 Pros: Getting a batch of reviewers in your categories is not only a way to get more reviews, but also promote your products to more potential customers. Simply input your listing URL into the search box and you will get all the contact information from the reviewers, which will save you a lot of time. Compared with other third-party review sites, AMZDiscover is much safer when it comes to complying with Amazon rules. What’s more, you can get all their contact information including emails and social media accounts. Cons: You need to be invited to use this software. Regular sellers cannot use the software. You must have an invitation code to access the software. Get an Email List with 100 Qualified Reviewers for Free! It might be difficult to get reviewers from product test. Don’t worry! 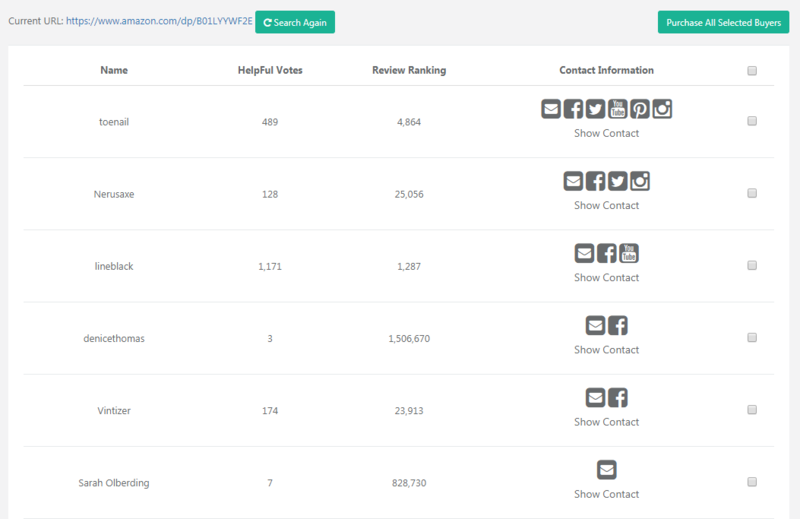 We have collected a batch of reviewers who have a large number of help votes and a higher ranking. You can learn from the following steps to get an email list for free now, which is available for everyone! Click on the button to share this article on Facebook via Email with hashtag #DiscoverReviewer. Send an email to support@amzdiscover.com with a screenshot or link of your post on Facebook. You got it! The email list of 100 qualified reviewers will be sent to you via email at once.